Rob and Chris kick off the SMG Podcast Marathon as they do every year, with a lot of joking around and discussion about what's to come. This year the theme is why indie podcasts are so important. 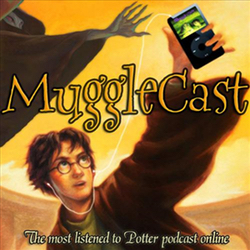 MuggleCast is the original Harry Potter podcast. The show launched in August 2005 and quickly gained an audience — over 50,000 listeners a week — thanks to its presence on MuggleNet, the largest Harry Potter fansite. Our quick growth told us one thing: Fans love hearing fellow fans talk about everything Harry Potter. Each week, we watch an episode of Star Trek and talk about it. We'll start with season 1 of each series and work through each season, one at a time. Hosted by Matt and Shirley, we bring on a guest host most weeks for a different view of Star Trek as a whole. The show recently expanded to include weekly coverage of Star Trek Discovery as well. A monthly show featuring a new sci-fi, fantasy, and horror story by author James Wylder, plus sketches, radio plays, and more! Explore strange new realities, all recorded live at the Blue Box Cafe in Elgin Illinois. Another Live at the Blue Box favorite, Pop Culture Countdown is where the hosts take a subject, bring in their top 5, and argue it out to land on the top 3 of something. You may think it sounds easy yet getting Rob, Martha and Chris to agree on the top 3 and an order to those top 3 is almost always a challenge. For this episode, expect the new version - Pop Culture Countdown Rapid Fire! Molly Southgate (10) brings her popular blog to the Podcast Marathon for the second year in a row. She discusses food, restaurants, cooking, and more. Season 2 of Masks of Nyarlathotep follows our spies and commandos in the midst of WW2. With the Nazi's calling on esoteric power, will our players be able to stop their evil plans? This a Call of Cthulhu 6th Edition role playing podcast, featuring the Achtung! Cthulhu setting. Join us in our story. TunesForAMinute is a video web series and podcast. We exist to give artists content, community, and opportunity. Martha, Chris, Alil, Rob, and Molly discuss the latest movies they've watched, old and new. If you're looking high level film criticism, this is not it. If you're looking for a great conversation about movies like you have with your friends, you have found the podcast. A Podcast where we cover the things in our lives that are geeky and fun. Join us for Whatcha Doin? !, Immediate Movie Reviews, Nerd's Domain on the Criterion Collection, B-Sides and Classics, and much more! Everyweek the League of Geekz brings you the latest and geekest of news in Movies,TV, and comicbooks. By all means were not experts but we do know our stuff, and the goal is to cover stories and review movies from our own view that will inform and appeal to you the movie or TV viewer and the geek. So sit back and enjoy the ride Because Where we’re going, we don’t need roads!!!! Jack Wengrosky discusses the art of trumpet playing with special guests and musicians. This Week in Geek is a <weekly> podcast that breaks down the latest geek news. They talk movies, TV, comics, music, books, video games, toys and more. Basically, if it tweaks our geeks we talk it out. A lively discussion and debate on comics, film, television and collectibles, all fueled by the magic of frappacinos. Music Under Glass is a live music podcast from the line up of Live at the Blue Box. Bands play and conversation happens. TIME CRASH is equal parts hard-rocking space band and sci-fi dance explosion. Ronen Kohn, lead vocalist and wielder of the GuiTARDIS, brings clear, bright vocals which soar over the tightest rhythm section in the galaxy, with Andy Rice on drums, Michael Fye on bass, and Christopher Rice rounding out the 'bigger on the inside' sound of this WHOlly unique TROCK band. Home to the unofficial family podcast about the BBC’s Doctor Who. Hosted by Molly (age 10), and her parents, Martha and Rob. Episode recaps, news, analysis and predications are all discussed on this weekly show. 3 contestants, 30+ Trivia games, sketchy rules, and an even more sketchy host! Trivia Mayhem is a trivia game show that mashes up roughly 30 different games into one chaotic trivial challenge. Trivia Mayhem has been a fan favorite on Live at the Box since the beginning.